We stringently make complete arrangements for the vigil examination of the inputs used for the products. By this, we are capable of bringing forth reliable products that are presented after complete inspection and examination by the experts. We are immensely recognized for delivering the orders within the stipulated time frame and at desired Sialkot(Pakistan). 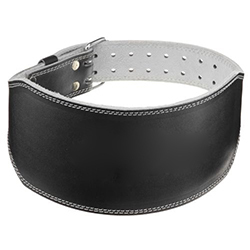 WB-403 Plain Leather Weight Lifting Belt has a soft lining with a Velcro closure for a power grip.